Cattails 6 in. x 6 in. Oil On Panel - BID ON OR BUY THIS PAINTING. These are cattails on a pond a few miles from my house. I had painted this pond several years ago as a full size painting. Today I wanted to try them again. The image is set in late afternoon and early evening. 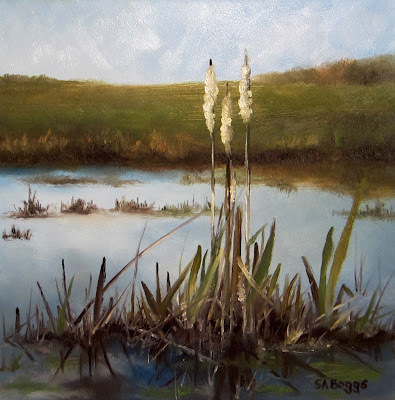 What I enjoyed both times that I have painted this scene is that there are essentially four stacked layers in the painting - The greenery of the cattails, the pond, the landscape in the background, and the sky, and they are all tied together with the stalk and tops of the cattails. I hope that you enjoy the painting!